Their romance began, as many romances do, with a floating brain. When Eddie Escher lived in Clementina, his pod-shaped house had a brain in a vat. And his neighbor Fallingwater Cellardoor would often stop by, to talk with it. "I used to say random things to Brain," Fall says, "to try to get a rise out of him. It didn't work." That's because Eddie had programmed the brain in the vat to control his house, but he hadn't scripted it to chat. So Fallingwater's conversations with the brain were decidedly one-way. Fall turns to Eddie. "I said 'Hi' to you, though, too." Eddie smiles, and agrees. "Always me first, then Brain." This story began, as many New World Notes stories do, with a totally different subject in mind. I originally stopped by Eddie Escher's new home in the Elf-themed Seacliff, because Eddie's one of the many residents who are also in the game industry, and use the world as a canvas for more personal projects. Eddie's an artist with a very well-known publisher, and he's working on a console game that's set in a crime-infested New York. (Some recent assignments involved modeling, as he puts it, "tramps, junkies, gang members".) On his Seacliff property, it's all elvish architecture and magnificent trees, and that's where I first spoke with Eddie and Fallingwater together. "I tend to spend a few hours a night in-world, during the week," Eddie says, "and don't always get a lot done until the weekend, when I'm logged in 'til the sun comes up." This isn't just a means of letting off creative steam for Eddie, because he sees it as integral to his career as a game developer. "Man, I want to work in Second Life one day, making my game graphics [in here]... plus, I intend to put some screenshots of Second Life [projects] of mine in my portfolio." One of those projects was his original pod-shaped home in Clementina, and this is where he first met Fallingwater Cellardoor-- who as it happens, had noticed his talents a lot earlier before she started talking to his floating brain. In any case, she thought the style of the home she had in mind would complement his place, so she put down roots, and began building. At this point, both of them insist, romance was neither expected, planned, or sought. "I was tired of going through the [dating] wringer," says Fallingwater, "and was happy being alone." "I joined Second Life because I was interested in the whole Snowcrash idea of a virtual world you could make things in," Eddie tells me. "To be honest, the idea of an SL romance seemed silly to me." He'd never found a girlfriend online before, and the women he did date were usually friends of friends. "I've never been adept at chatting [up] women." About two weeks after they met in-world, they were speaking by phone, and exchanging photos. "I remember when I first started fancying Fall," Eddie recounts. "She always had people visiting her on her plot, and sometimes I was a bit shy, and wouldn't go over... I was a bit of a hermit, always building rather than socializing." That he didn't immediately join her endless stream of visitors suggested something else was at work. "By that time we had become friends," says Eddie, "and I guess I was starting to feel an attraction to her. Otherwise, I wouldn't have felt shy." I ask him if it was also because he realized then that he wanted more time with her all to himself, away from their friends, and he laughs again. "I must admit I liked getting her alone," he says. Sitting with him and Fallingwater, I ask them both a question that confuses me. "Why were you shy? It's an online world, and you have an alter ego." Fall looks at me. "That's silly, Hamlet, we're still us-- I don't feel I have an alter ego here. Although I am also shy in real life, and it's a bit freeing here... it's still just me." For despite the Elvish costumes and scenery, Eddie adds, "Neither of us are into roleplay. We are who we are." And being who they were in-world-- building things together, admiring each other's works, was the way for them to connect, and push past the initial shyness. "I guess creativity has been there from the start," Eddie muses, "and is an attraction between us. I love getting blown away by the next thing she comes up with-- jewelery, plants, trees, structures!" For as it happens, they're both intrigued by objects with curving shapes and organic creations, curlicues, toruses, and so on-- which was why Fallingwater first noticed Eddie's pod-like home, in the first place, and decided to move next door. "Curves are something we both love working with... they're challenging, and look so damn good," says Eddie. And, he notes, "Fall is about the best tori torturer I've seen." I ask them if they swapped real world photos of themselves before they fell in love, or during. "During," says Eddie, smiling. "We fell in love with each other's minds, before we saw the bodies." For Fallingwater's part, she says, "I fell in love before, and it's a good thing he looked cute." "So you'd love him even if he didn't?" "Well... there does have to be chemistry. But I'm sure I'd still love him in some way, regardless." That's about when they decided to meet each other in person, and at this point, it's worth mentioning that Eddie Escher lives in England-- and Fallingwater Cellardoor lives in New England. So Eddie's first flight out to Fallingwater was no small expense. And no small risk, if things didn't work as well in first life, as they did in-world. "You want to know my bestest, favoritest happy memory from my life so far?" Eddie asks me later. "It was our first kiss, meeting for the first time in [the airport.] Seriously. Everything around us just melted away, man, for both of us. I have no idea how long we were standing there like that." More visits to England and New England followed. And in a few months, after Eddie secures a visa, he'll send for Fallingwater, and she'll leave the United States, and she'll fly over the ocean to England, to be with him permanently, as his wife. 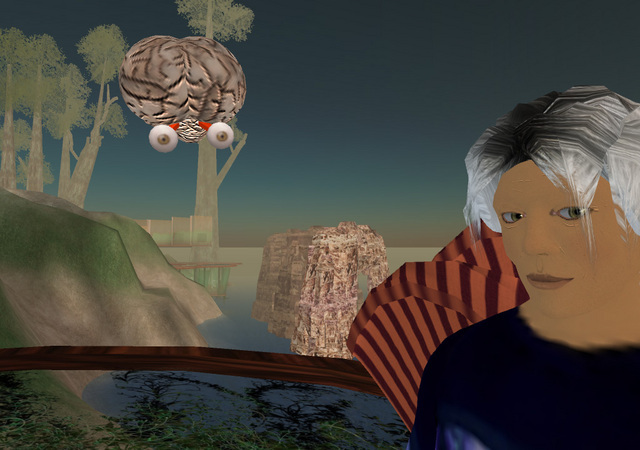 For now, then, Second Life is a way of keeping close, in the interim. "[I]t's a great way for us to spend time together while we're apart," says Eddie. "Fall is the most wonderful woman I've ever met... and I wouldn't go through all the traveling and pain from being apart, if she wasn't special. I was only just starting to pull myself out of a year-long funk, when we met. And things have just got better since... [Y]ou've been looking and failing to find your perfect partner for 35 years, and almost given up, and then out of the blue, when you're not even looking, you instantly fall in love with someone that turns out to be perfect in every way. Man..." He stops short and laughs at himself. "This is kinda hard to describe without gushing some." But I wonder if all this seems too starry-eyed, so I ask them if they're even nervous about what happens, when the digital becomes secondary, and their relationship is one they primarily live in the flesh. Not one where it's two brains in a vat, so to speak, but where it's day to day and undeniably material, together as man and wife in England. "We know we get on really well from our visits," says Eddie, unworried. "And we have a pretty good idea of the ways in which we're different," Fall notes. "And how to deal with that. And we will still be in Second Life just as much as now." While she talks, I look out on the hills of Seacliff, and the dark water around it. Sitting on a green leaf next to Eddie, Fallingwater has another thing to say. "Someone once told me something I thought was very wise. She said you have to decide to love someone. So that even when you hate him, you still know you love him. It's a decision, not something that just happens." I concur, Fiz. 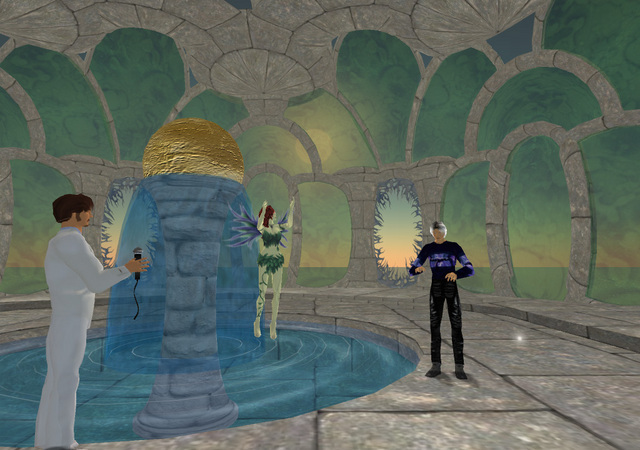 FW and Eddie are two of my most favorite people in Second Life, despite their slushy lovey doveyness. They are kind, funny, generous and they are both incredibly talented individuals. 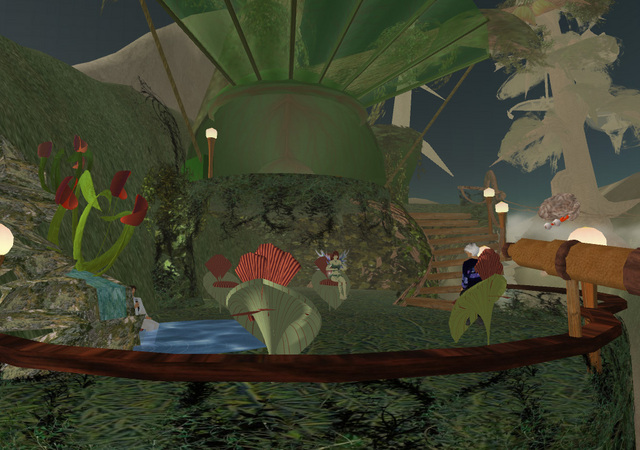 I can credit FW for the inspiration that lead me to create my own works in Second Life, after being simply awestruck by her organic creations early on in my Second Life career. Actually, come to think of it, they make me sick. Bah. >Actually, come to think of it, they make me sick. Bah. Ya better. I love ya both. But you ARE just sickeningly nice, sickeningly talented people. Grr! You know, Eddie, you really should put that house up on display somewhere. Or sell copies of it to lonely guys... It was the thing I saw that made me sign up for a full account back in the day! Hamlet, I hope you'll do a follow-up with real life wedding photos and all? Surely Robin will send you to England for such a momentous event! Kiss the bride for me! 1)Aw, you guys are sweet! Not as sickeningly sweet as us, of course. 2) Eddie's pod house is such a babe magnet! I'm glad I got there first. 3) Hamlet: Although New England sounds better for the article, it's actually Philadelphia. with East Coast geography is now exposed. for a vaguer reference there. Yay for Fall and Eddie! EDDIE! It's you! Remember me? eddie and fall are two of the first real friends i made in sl. while i don't see as much of them as i'd like, they remain my sugarparents as they helped me get started in second life. they are among the best people i know in sl or anywhere else for that matter. somebody please tell me this is a spoof! Ah such a happy story, and to such wonderful talented ones. I love that such things can happen in the SL world. The new bulgarien Potete ottenere sorpreso dal relativo prezzo acquistabile mentre lo paragoni all'relativi alta qualit� e disegno unico.